I am a huge fan of Elizabeth Gilbert, beloved author and empowering speaker. On New Year’s Eve she posted about something she does called The Happiness Jar. Well, I was completely inspired and totally jumped on board. 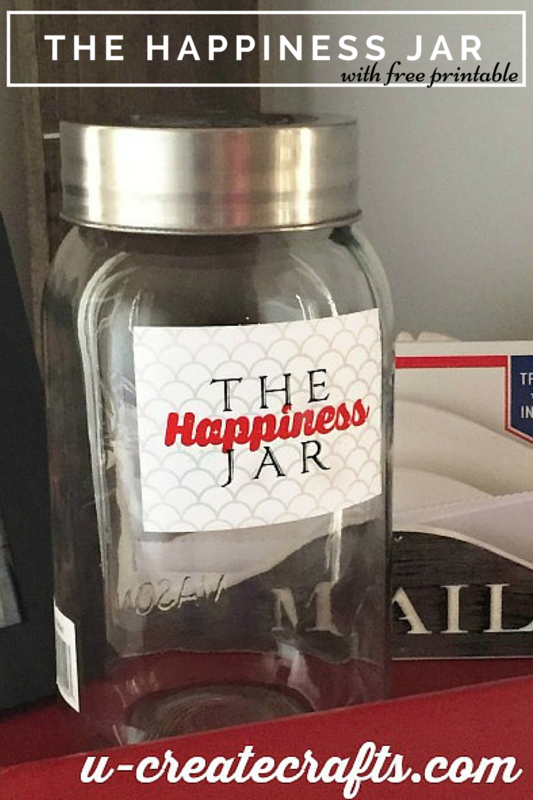 I found a big “mason type” jar in my cupboard, created a Happiness Jar label and printed it on a 4×6 adhesive label. I stuck it on the jar, cut up lots of strips of paper and put some pens next to it. Simple, right? My family is so excited to document our year this way. Our Happiness Jar will be filled with movie stubs and tickets and memorabilia from the year as well as happy moments from each day. I am so excited to do this in my home as the aura among my kids (and, let’s face it, among myself) has been somewhat negative and “wo is me” lately. I am confident this will change our thinking to focus on the goodness that happens throughout the day. If you end up making your own Family Happiness Jar, post it on the U Create Facebook page so we can see what you come up with! You can read more about how Ms. Gilbert’s happiness jar at this Facebook Post. I did this for my kids because they were whining that “nothing good ever happens” to them. Well, we just went through them recently and they were amazed and happy at all the wonderful things they actually have been doing! Awesome. Thank you for sharing your experience. Having The Happiness Jar has been great fun for my family this year! Great idea! Will be using this with my family.